In the past ten years, literature by U.S. Latinos has gained an extraordinary public currency and has engendered a great deal of interest among educators. Because of the increase in numbers of Latinos in their classrooms, teachers have recognized the benefits of including works by such important writers as Sandra Cisneros, Julia Alvarez, and Rudolfo Anaya in the curriculum. Without a guide, introd… ucing courses on U.S. Latino literature or integrating individual works into the general courses on American Literature can be difficult for the uninitiated. While some critical sources for students and teachers are available, none are dedicated exclusively to this important body of writing. To fill the gap, the editors of this volume commissioned prominent scholars in the field to write 18 essays that focus on using U.S. Latino literature in the classroom. The selection of the subject texts was developed in conjunction with secondary school teachers who took part in the editors' course. 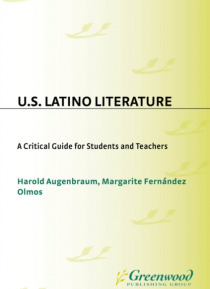 This resultant volume focuses on major works that are appropriate for high school and undergraduate study including Judith Ortiz Cofer's The Latin Deli, Piri Thomas' Down These Mean Streets, and Cisneros' The House on Mango Street.Each chapter in this Critical Guide provides pertinent biographical background on the author as well as contextual information that aids in understanding the literary and cultural significance of the work. The most valuable component of the critical essays, the Analysis of Themes and Forms, helps the reader understand the thematic concerns raised by the work, particularly the recurring issues of language expression and cultural identity, assimilation, and intergenerational conflicts. Each essay is followed by specific suggestions for teaching the work with topics for classroom discussion. Further enhancing the value of this work as a teaching tool are the selected bibliographies of criticism, further reading, and other related sources that complete each chapter. Teachers will also find a Sample Course Outline of U.S. Latino Literature which serves as guide for developing a course on this important subject.